New, exceptionally large 2 bed 2 bath, 1st floor apartment with large south facing balcony and huge private roof terrace overlooking pools and gardens, fully furnished to a high standard with hot/cold air-con. Ideal for families, couples and golfers it is situated on the 5 star Vila Sol and Golf resort. Guests have access to the hotel facilities including tennis courts, pools (including 2 children’s and indoor pool), jacuzzi, kids club and two 5 star restaurants (costs involved). Vilamoura is a modern town, which surrounds it’s own spectacular marina, and is only 5 mins drive away, with welcoming waterfront cafes, top class restaurants, designer boutiques and also a sophisticated casino. For family entertainment there is a large aqua park within a 3 min drive and also close is the Zoo Marine which has live dolphin shows and lots to do. One of the largest shopping centres in the Algarve is approx 15 mins drive from Vilamoura which has a huge variety of shops and foodhall. Steve and Yumi live in Chiswick, West London with their daughter Yvie. Steve runs an HR Consultancy and Yumi works for Virgin Atlantic. We spend our time between England, Japan and Portugal. Well that depends on what you are looking for but for us, we like the roof terrace which gives you a wonderful feeling of space and a great view of the stars. The perfect chill out. There is an excellent supermarket, Pingo Dolce, about five minutes drive away. Taxis are cheap so you don't really need to hire a car. However, if you have a car, so many places are within easy reach, it really feels like it’s right in the middle of everything (Faro, Quarteira, Vilamoura, Loule). With the main highway only about 5 minutes drive away, you also have quick access along the coast either East or West. Back to the apartment, we particularly like the underground car park. There’s nothing worse than having to get into a steaming hot car! Plus, we now have wifi, perfect! Separate bathroom between bedroom 1 and 2 with jacuzzi bath, shower, wc and bidet. En-suite bathroom to bedroom 2 with shower and wc. Large sofa, dining table and chairs. DVD/CD player, ipod docking speaker and 42 inch plasma. Kitchen fully equiped with cooker, hob with extractor, fridge, freezer, microwave, dishwasher. 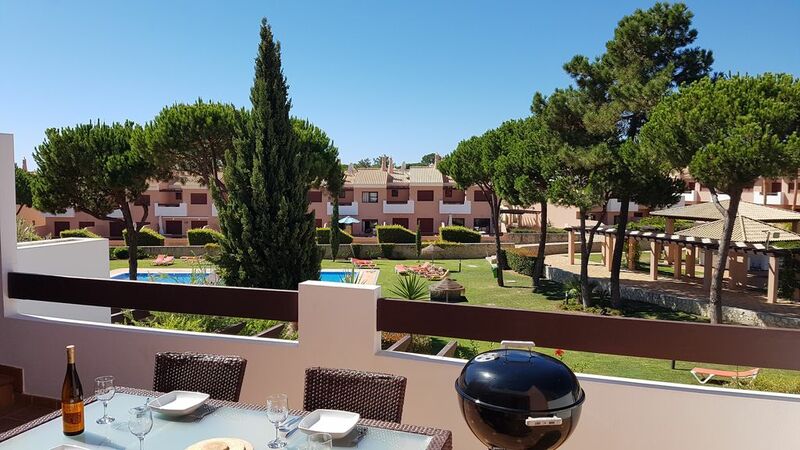 The apartment is set within the exceptional 27-hole Vila Sol golf course. This Championship course has twice hosted the Portuguese Open. It is renowned as one of the best in the Algarve, designed by established architect Donald Steel. It has a fabulous club house including a restaurant. The golf course is of a natural design and follows the wide valley and is split into 3 loops with 3 levels of difficulty including Prime, Challenge and Prestige. Golf buggies are available at the club house. Other local courses are all within a 15 min drive. Notes on accommodation: Free Wifi is also available in the golf club and at Oscars, an irish pub close by. There is a kids club for children over 4 years old if you want a bit of piece and quiet! It is in the 5 star hotel two minutes walk from the apartment. Pets of any kind are not allowed in or on the premises at any time. Smoking is strictly prohibited inside the property but there is a large terrace and roof terrace. A welcome pack of groceries (eggs, milk, bread, butter, jam, tea and coffee etc) can also be arranged if required, again at an additional cost. Outside: The gardens are mature and manicured with paths and walkways for convenience. The development is low rise and all residential buildings are maximum 2 storey. The pool areas are shared and equipped with furniture for sun bathing and showers. The roof terrace is completely open and therefore has the sun all year round. It is private and is equipped with furniture for sunbathing. For added security there are electric shutters on all accessible doors and windows and an indoor safe. Utility Room: Washing machine. Cleaning / Towels / Linen / Maid service: The price includes having a cleaner in before you arrive and after you leave to ensure towels and bedlinen are freshly laundered and the place is clean and tidy. If you would like a maid to come in during your stay this can be arranged at an extra cost. Other: Terrace with table and chairs and roof terrace with sun loungers. Communal wifi accessible from the terrace. Fabulous apartment. We will be coming back ! The apartment was as the photos. It was very well equipped with air-con throughout the apartment which was needed as it was very warm during our stay. UK tv channels were a bonus and everything looked new and comfortable. Apartment was clean and well equipped. Support and contact with property manager was good. There is everything that a family travelling would ever need...it was great to have a BBQ and cook in a proper kitchen! We have all enjoyed it so much I can not tell you! Spent a lot of time in the apartment was like home from home! We are a family of 6 and we all greatly enjoyed our stay in your apartment. The apartment was spacious, clean and very comfortable. The resort ideal for families. We enjoyed several meals out at both Wildfire and Oscars. We would highly recommend the apartment. Vilamoura Marina beach is only a 5 min drive away. Falesia Beach is only a 10 minute drive away. The gentle sloping beach of Quarteira is excellent for young families. Faro airport is only a 15/20 min drive away. Car hire is recommended but taxi hire is readily available and inexpensive. Public transport is frequent and also inexpensive. There is a large supermarket close by and a few bars and restaurants within walking distance of the apartment. Vilamoura with it’s marina, shops, restaurants and bars is less than 5 mins by car. Almancil which offers supermarkets, banks and karting is less than 10 mins by car. The market town of Loule is just 10 mins drive. The aquapark is 3 mins away by car and the Zoo Marine is 30 mins where you can swim with dolphins. The neighbouring Pestana hotel provides guests with a range of facilities and dining options. There are two restaurants and two bars including a Piano bar and a Golf Bar.